To be perfectly honest, I didn’t come to Apawamis on a Sunday to watch a men’s match. I drove up to Westchester from NYC to see the women’s doubles finals of the Briggs Cup. I’d seen plenty of guys playing doubles the weekend before. In the Big Apple Open. 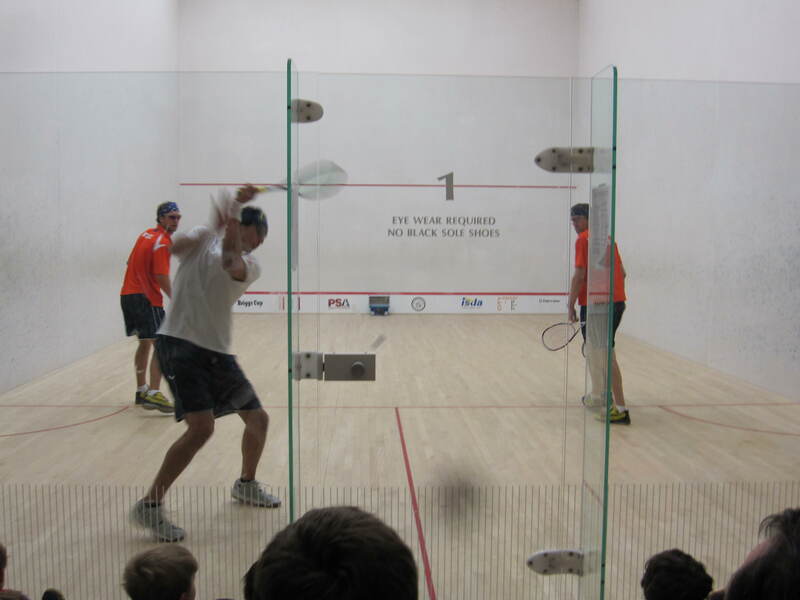 I watched Damien Mudge and Ben Gould play Matt Jenson and Clive Leach. Again. And win. Again. Not that it wasn’t interesting mind you. With their crushingly hard drives and deathly accurate nicks, Mudge and Gould are awesomely entertaining to watch; they both exhibit an on court ease that masks murderously fast racquet skills. But when a team has as long a winning streak as Mudge and Gould do, you can’t help cheering for the underdogs. You can’t help wanting to see something unexpected. But on the night of the Big Apple finals, all expectations were met. 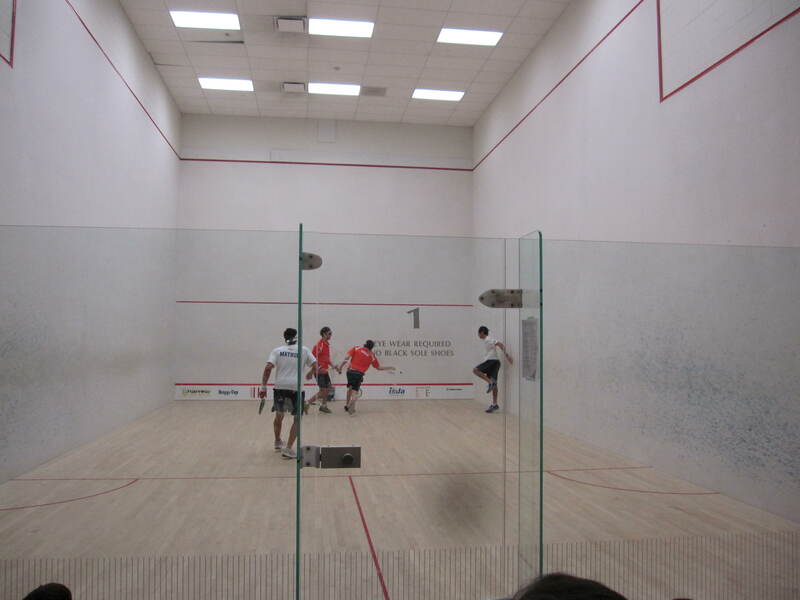 On that night, I heard a few observers mention their semi-finals match the day before against two recent Trinity alums Manek Mathur and Yvain Badan. They had won, obviously, but Mathur and Badan had made them fight for it in four tight games. I was intrigued. So when I heard that they’d be facing each other later that afternoon in the Briggs Cup semi-finals match, after the women’s finals, I decided to hang around. I was very, very glad I did. 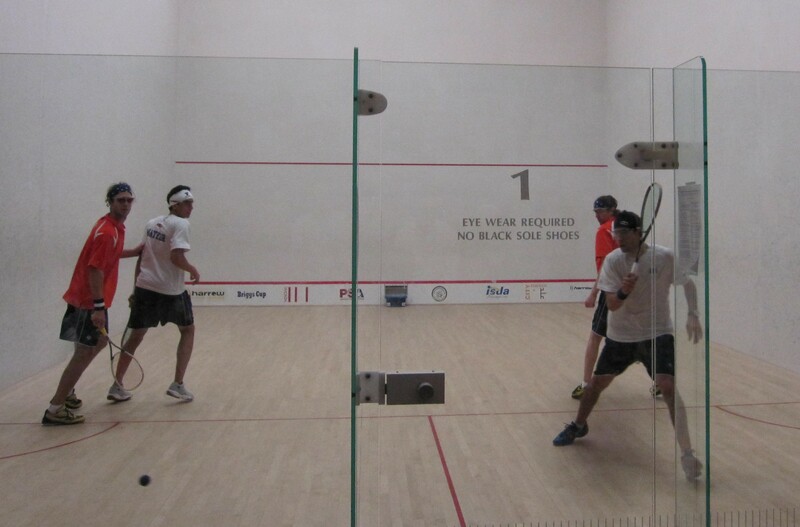 At first glance, Mathur and Badan don’t look all that different than other young players on the ISDA tour. They’re both still slender and look like they could run around the court for hours. If Mathur isn’t as tall as Mudge, he’s close to but probably weighs a few racquets worth less. Possibly not a bad thing. And while Badan may be the shortest guy on the court, it’s only by an inch or two and his legs look springy. Badan plays the right wall against Gould. Mathur, a lefty, is up against Mudge. I think this should be good. But the beginning of the first game is not that good. For Mathur and Badan that is. I’m not sure if it’s nerves or that they’re being totally out-played but Mudge and Gould rack up the points quickly. They get them with lovely cross-court nicks and volley drops and passing rails; it’s like they’re in a candy store, just picking out whatever shots they want and they get six of them in a row before Mudge breaks his racquet and goes to fetch a new one. Maybe that gives Mathur and Badan a chance to chill a little, because they finally get their first point at 1-7 and start to get into the game. Mathur’s drops begin to sneak above the tin instead of below it and he brings out a few other shots in his arsenal, like a nice three wall nick. 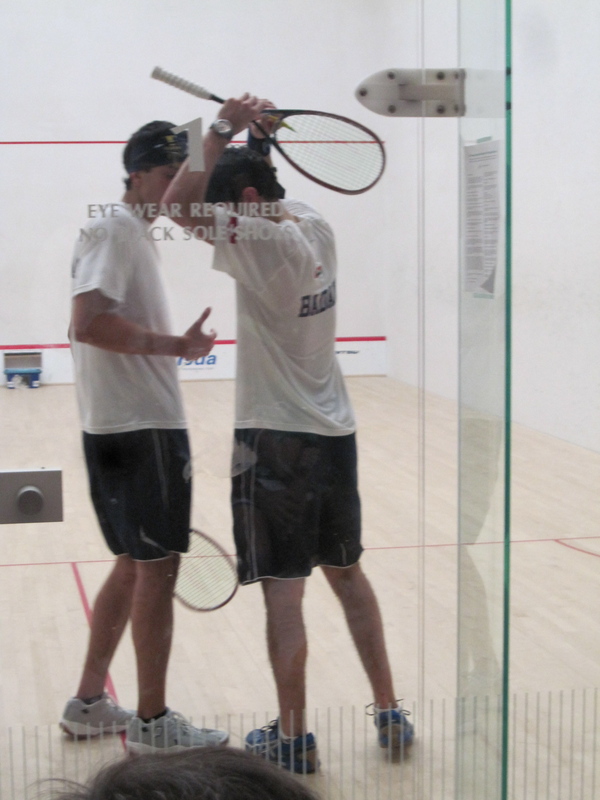 It’s hard to get much by Mudge and Gould–they know the court so well–but an accurate nick will get anyone and Mathur and Badan pull enough out that they get up to nine before Gould and Mudge shut them down at 15-9 for this first game. The first point of the second game goes on a lonnnng time, and it’s clear that Mathur and Badan aren’t there to lose. They’re both extremely fit, go for everything, and are feeling confident enough to go for winners. I realize that my mouth is agape when they get the first point; it’s truly thrilling squash and both teams are showing everything they’ve got. During a hard rally at the front, Mudge even does a full 360 after hitting the ball with full body strength. He spins and is ready for the next ball coming at him. It’s difficult not to be in awe of Mudge’s preparedness; half the time he looks like he’s out for a stroll, casually watching the world go by, and then when the ball comes within range, he considers it and just puts it exactly where he’d like to see it go. Like moving around a vase of flowers in his home or something. No big deal. Although it is for his poor opponents. The vase often shatters before they can get to it. Mathur and Badan aren’t so poor, however. At seven all, Mathur gets a nice nick and then Mudge tins the next, Mathur gets another nick, and Gould can’t get his racquet firmly on a ball off the back wall. It’s now 10-7 and I hear Mathur tell Badan to take his time; they’re up, they need to be patient. Mathur must know something though, because Badan goes for a drop and tins it. Within minutes, Mudge and Gould have tied it up at ten all and although Badan gets one more straight drop nick, they lose five points in a row. 15-11. Game two to the kings of doubles. I have to say I’m a little depressed that Mathur and Badan are two down. The guy sitting next to me must be an Apawamis member as he is clearly pulling for the team (Badan coached at Apawamis for a while, and both play there), but he muses aloud that they probably need more time before they can beat them. They’re just too strong, he says of Mudge and Gould. I agree. Mathur must not agree because he’s acting like the whole court is his at the beginning of the third game. He doesn’t stay on the left wall, or even the back, but zooms over to cover the entire front wall, calling ‘mine’ and giving each shot everything he has. I stare in awe, and I think it gives Mudge and Gould something to think about as well. Here’s something new to contend with, so they compensate by taking the ball away from him and giving it to Badan again and again. It works for a while. Mathur is an expert shot maker and Badan keeps the ball mostly in play with lobs and crosses; but anyone who can return Gould’s punishing speed at which he hits the ball has to be pretty expert as well, and just when I’m beginning to think that it’s okay that he doesn’t have the touch that Mathur does, Badan’s patience pays off. He gets a pretty cross corner nick at 12-10 and then a few points later powers the ball low for a straight short kill shot. The crowd is holding their breath and my palms are sweating. But I have to sweat through five more points because Mudge and Gould are stubborn when it comes to losing and who knows where losing one game might lead, so with a combination of crushing power and lovely nicks, they push hard until it’s match ball at 14-14. No set. Sudden death. Many of us may lay down our arms at this point. Or fire too soon. But to Mathur and Badan’s credit, they stay patient, waiting for the right moment. And it does come….down the middle, and right past Mudge’s racquet. 15-14. The crowd roars. Game score 2-1. If you didn’t know by now, this crowd is almost solidly for Mathur and Badan, even if they might count Mudge and Gould as friends. And I’d say that there were at least one hundred fifty people watching in the small gallery, standing room only. Kids are sitting two and three deep on the floor in front of the court. I can’t remember the last time I’d been in such a tightly packed crowd of squash spectators, and so focused and on edge. I don’t blame Mathur and Badan if they felt a bit on edge at the beginning of the fourth as well, as Mudge and Gould pushed ahead to three zip. It’s a lot of pressure. But they already showed they don’t back down and this may be where the crowd’s support became much more audible. The air is filled with shouts of “Come on Swiss!” “Let’s go Manek!” Later, I find out that Badan was the Swiss Junior National Champion in 2000. And quite possibly that support helps them come back, slowly but surely, from 4-8, to 5, to 6, to 7, and then it’s 8-8. They do this by playing safe but smartly and going for the winning shots when they’re set up. It ties again at 10-10 and then at 12-12. And then Mathur and Badan pull away. 13-12, 14-12. Game point for them again. The light on the court flickers out, as it has every 45 minutes or so throughout the afternoon – on a timer someone says. After it comes back on, the point is played and Mudge goes for one of his usually perfect nicks. Only this one isn’t so usual. It tins. 15-12 I circle and underline four times. The guy next to me wonders aloud again: when was the last time someone took two games off of Mudge and Gould? I don’t know. No one around us does. It doesn’t matter. Now we’ve seen it. But we haven’t seen everything. It’s the fifth game and we all know that anything can happen. And Mudge and Gould seem to be realizing this, too. They didn’t in the two last games. But this is the fifth. Have they ever played a fifth together for over a year. More? Unlike the last game, Mathur and Badan start much more confidently. The pressure seems to have moved off of them and onto Mudge and Gould. They’re the ones in a new position. 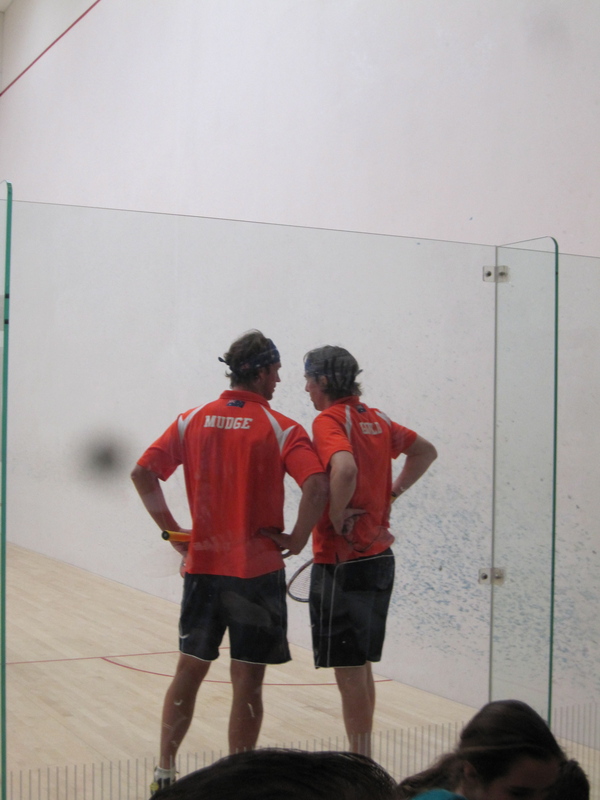 And Swiss and Manek like where they are, playing more loosely, patiently, lobbing, setting each other up. Both of them are getting their drops and nicks now; they can’t seem not to. And the crowd is right behind them. I almost feel badly for Mudge and Gould, but I’m pulled along in the wave of watching history unfold. And this is a beautiful sight to see. Players rising to the ocassion and not letting it pass them by. At 4-6, the ball breaks and I wonder if this is Gould and Mudge’s chance to regroup and recover, but there’s a change in their playing that even a break can’t stop. They’re more cautious now and their usual winners aren’t hitting their marks. 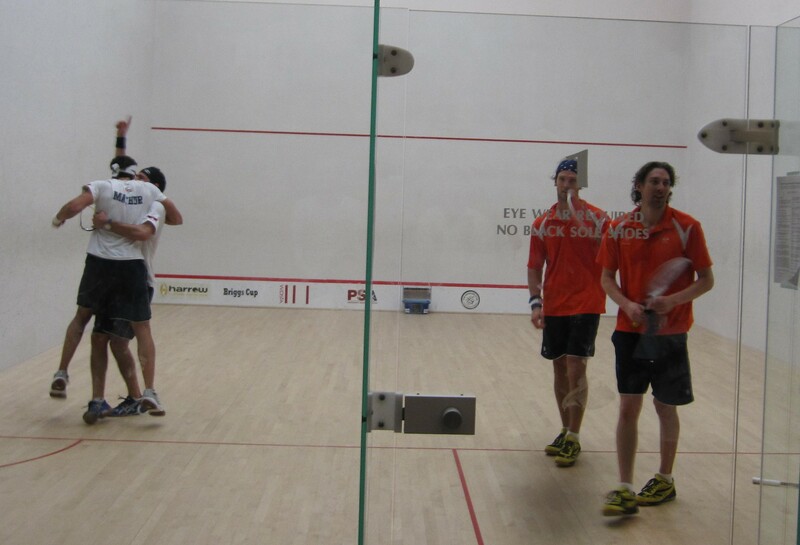 The normally cool Mudge swears at himself and Gould lost his affable grin back in the fourth game. If it’s possible, Mathur and Badan must smell their desperation. They use it and get drop after drop; Mathur is on fire and there is nothing Gould or Mudge can do to put it out. 4-6 is the closest the two get, as Swiss and Manek pull swiftly away, missing just a few shots so that by 13-7, they’ve nearly doubled Gould and Mudge’s score. Going for a cross court nick, Mudge puts the ball into the tin and then it’s match point again, only now for the team that nearly lost in three. At 14-7, Badan serves and then goes for a forehand volley into the left wall nick. Mudge puts out his racquet and gets only air. It’s over. Badan and Mathur have beaten the kings of doubles in this semi final for the history books. I can’t believe I was there. I bet you wish you were, too. 2 Responses to A Semi for the History Books: Big Upset at Briggs Cup! Good on you Manek. Well done.